When anti-Catholic prejudice was still rampant in the South during the early 1950s, Sister Marietta Russell was knocking on doors and sharing her faith in the small towns of South Carolina. Dressed in the full habit worn by the Mission Helpers of the Sacred Heart, Sister Marietta spent time listening to the needs of people in upscale neighborhoods and the poorest cotton plantations. She instructed many in Christianity and even won the trust of Protestant pastors who allowed her to minister among their congregants. Although she’s been retired for six years, Sister Marietta hasn’t slowed down. She helped start a sewing club at Transfiguration Catholic Community in Baltimore and volunteers every Saturday teaching 12 inner-city youths how to make clothes. Sister Marietta is one of approximately 173 retired religious sisters, brothers and priests who live in the Archdiocese of Baltimore. They devoted their lives to serving others and now the Catholic community is remembering them with an annual special collection benefiting the National Retirement Fund for Religious. With a struggling economy and an ever-increasing number of retired religious, Catholic leaders say the need is greater than ever. According to the National Religious Retirement Office, there are more than 35,000 religious, mostly women, who are older than 70. More than 5,500 need skilled nursing care. Sister Marietta noted that when she and other religious were active in fulltime ministry, they were not eligible for Social Security. She worked for just $200 a month. 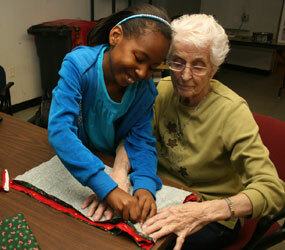 In their retirement years, elderly religious depended on the work of younger members of their congregations. Today, as the number of elderly religious far outstrips the younger members, financial resources aren’t as available. According to the National Religious Retirement Office in Washington, D.C., retired religious today receive an average Social Security benefit of just $4,156 annually. A New York native, Father O’Rourke was the first principal of St. Augustine High School – a historic Catholic institution in New Orleans founded in 1951 to minister to the African-American community. “We were very much interested in the social questions of the time,” said Father O’Rourke, noting that St. Augustine offered classes to teach African-Americans how to pass what he called “terrible” tests required by the state for blacks to vote. Father O’Rourke later ministered in a variety of other capacities and served as the superior general of his religious community in the 1970s. He and other retired Josephites today spend much of their ministry in prayer. Xaverian Brother Daniel Lynch, a New York native who entered the Xaverians in 1951, spent all his ministry in education – including several decades working among members of the Lakota Tribe. Now 75 and retired, Brother Daniel volunteers to help Baltimoreans earn their GED at the Learning Bank in the city. Approximately 95 cents of every dollar donated to the National Religious Retirement Collection assists with the costs of elder care at religious institutes throughout the country. The special collection for retired religious will be held Dec. 12-13. Donations may be contributed at local parishes or checks may be mailed to: Office of Consecrated Life, 320 Cathedral St., Baltimore, MD 21201.